This little dog was discovered in the Gobi desert in China on 155-mile race. The thinking that this dog is a “chihuahua cross” is a bit wrong, I think. I think she’s something a bit more special than that. I think she is a landrace East Asian toy dog, the ancestral form that leads to the Pekingese, the original pug, the Japanese chin, and other dogs of this type. I don’t there are many chihuahuas in the Gobi Desert, and she certainly should have her DNA tested. My Cat & Dog Film Festivals Are Coming To NYC This Weekend! I am more excited than I was as a 3-year-old when there was a clown and pony rides at my birthday party! In 48 hours my NY Cat and Dog Film Festivals are going to take over the SVA Theatre in Chelsea and light up the hearts of pet lovers in New York City and the surrounding area. The big difference between this and my childhood party excitement is that there are a lot more people coming to the “parties” I’m throwing this weekend in New York City. And I sure hope you will have a chance to join us for a once-in-a-lifetime experience of sharing with like-minded animal lovers the bond you feel with pets. I truly hope to share this experience with many of the people who listen to my pet talk radio shows ad meet them in person. Leanne Italie wrote an insightful paean to the festivals for the Associated Press (AP) and the Washington Post was the first to grab her story. The separate festivals are on different days – Saturday afternoon December 9th for the premiere of the NY Cat Film Festival™ and Sunday the 10th for the 3rd Annual NY Dog Film Festival™. Both festivals consist of two separate programs of completely different short films (animated, documentary and narrative) which each have an incredible medley of short films celebrating the species of choice. The Cats Have Their Day! For the first time ever, the NY Cat Film Festival™ will premiere with an intellectual and emotional roller-coaster ride for cat lovers, similar to what dog aficionados have experienced with the NY Dog Film Festival™ for two years. The NY Cat Film Festival™ is funded by Dr. Elsey’s Precious Cat, a wonderful family-owned, philanthropic Colorado-based business, with all their products developed by Dr. Elsey himself, a feline-only veterinarian. The festival features two 70-minute programs of short films that explore our fascination with the felines who share our world. Gina from Dr. Elsey’s is flying in from Colorado to hand out samples and coupons from Elsey’s Precious Cat, with the help of volunteers from the Mayor’s Alliance for NYC’s animals, which has a Feral Cat Initiative, which is the beneficiary of a portion of every ticket. Today in the New York Times, Laurel Graeber wrote this INCREDIBLE piece about the NY Cat Film Festival™. I am bursting with happiness and gratitude that she captured the essence of what it’s all about – two completely different programs of short films focused on cats. The programs are 70 minutes long each, one at 3:00 PM and the second at 4:30 PM. Get information about all the films and how to buy tickets (and I do recommend buying ahead of time because we are getting close to selling out and that’s even before other people read those wonderful articles I just shared with you!). The 3rd Annual NY Dog Film Festival™ will take on Sunday December 10th As I wrote last week, the initial funding for the NY Dog Film Festival™ came from Halo – who then passed the baton to the philanthropic Petco Foundation to that the festival could travel the country last year and going into 2018. Pura Naturals Pet is a sponsor of the festival and the first 300 ticket buyers to each of the two programs will get a sample of their organic shampoo and wipes. Weruva pet food is a sponsor of the dog festival and will be there distributing samples of their good-enough-for-people-to-eat food. The Filmmakers Get Their Swag Bag of Goodies! There are so many terrific filmmakers flying in from around the country, and even abroad, that I had to do something a little special to fete them. The photos show all the lovely gifts they’ll be receiving in their very nice carry bags – CAT CHAT® baseball caps for the cat folks and a branded Dog Film festival leash and t-shirt for the canine crowd. My favorite interactive cat toy, the Nekoflies, went to every cat filmmaker as well. Halo® put freeze-dried Liv-a-Little salmon in the cat bags and the chicken Liv-a-Littles for the dogs, along with canned food for each species, as well. For the feline filmmakers, Jackson Galaxy graciously put his new book TOTAL CAT MOJO in their bags, as did Rita Mae Brown with her Mrs. Murphy mystery “Tall Tail,” while dog filmmakers receive Heather Weston’s gorgeous picture book, “Canines of New York” and “Loyal: 38 Inspiring Tales of Bravery, Heroism and the Devotion of Dogs,” by Rebecca Ascher-Walsh. Pura Naturals put in big bottles of organic, cruelty-free lavender cat or dog shampoo, and GoodNewsforPets.com has a thank-you for every filmmaker, too: flashlight flashdrives with Moleskin memo pad. There will be volunteers from our beneficiary, the Mayor’s Alliance for NYC’s Animals, and others from NYC Animal Care Center to let people know about how to foster and adopt, all “waving the flag about the great animals for adoption among the more than 150 rescue groups the Mayor’s Alliance supports. Student members of the Stuyvesant School Canine Appreciation Club will be on hand again, helping me greet and seat people and make sure everyone has an optimal time. Won’t you join me for this very special weekend? Dogs vomit undigested food occasionally and if this happens to your pet it shouldn’t be cause for alarm. It’s normal for dogs to vomit sometimes, but if the vomiting is accompanied by diarrhea or bloody stools, the dog should be examined by a vet and treated as soon as possible. Looking at my 10-year old Beagle, Penny, I have old dogs on my heart today. Since it’s Giving Tuesday, I would encourage you to donate your time and / or money to a shelter near you that serves old souls. Until next time, Good day, and good dog! Next Tuesday morning, December 5th, I’m going to be on Fox News “Good Day New York” between 9:30 and 9:50 AM to talk about the 3rd Annual NY Dog Film Festival™ on December 10th at the School for Visual Arts Theater on West 33rd Street – and the 1st Annual NY Cat Film Festival Saturday December 9th – along with two of the wonderful women filmmakers whose work is in the festivals. It’s really all thanks to Halo! Halo, Purely for Pets has been a devoted sponsor of my NPR show DOG TALK® (and Kitties, Too!) and without a moment’s hesitation they stepped up for the idea of a dog film festival. They gave me the funding to help me rent a major New York theater and curate a program of canine-themed films. Lo and behold I had a “rookie’s luck” and we packed the theater twice over! With all the many cultural offerings vying for peoples’ attention in New York City on a Fall weekend, we managed to attract hundreds and hundreds of enthusiastic dog lovers. The Petco Foundation then joined Halo and gave me a generous grant to take the NY Dog Film Festival™ around the country in 2016 and 2017, to share the joy and spread the wealth with an animal welfare group in each city. The Petco Foundation continues to be the wind beneath my wings in NYC – and as the festival will continue to travel in 2018. I’ve added the 1st annual NY Cat Film Festival on Saturday December 9th – with the support of Dr. Elsey’s Precious Cat – and cat lovers will finally have their moment of glory in two programs of short films admiring the fascinating felines who share our world. Halo is still part of the festivities as they are giving lots of delicious products for the gift bags that the chosen filmmakers will receive for both festivals. Halo has included Liv-a-Little freeze-dried protein treats for dogs or cats, canned dog and cat food, and lid covers for the leftovers! Tune in to Fox News on Tuesday December 5th before 9:30 AM to see me live on the air on Good Day New York! And I hope to see you at both festivals – Saturday December 9th for cats and Sunday December 10th for dogs. Tickets for the 1st Annual NY Cat Film Festival are HERE and the 3rd Annual NY Dog Film Festival are HERE. Must have been traveling first class! Happy Friday! Until next time, Good day, and good dog! Well guys, it’s full on winter here in Chicagoland. There might not be snow on the ground, but it’s brutally cold. And that means that it’s official my least favorite season for getting dressed. 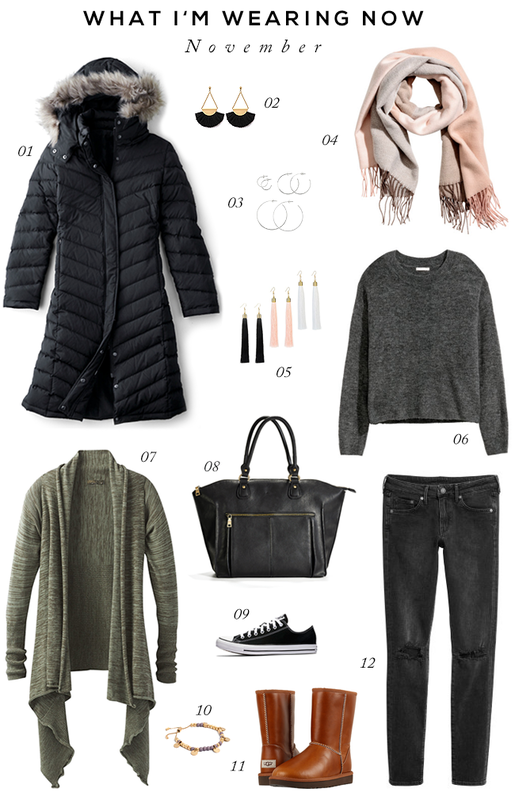 I mean, I can appreciate a good layered look, but a winter coat, blanket scarf, hat and gloves over a sweater over a thermal shirt, jeans, socks, and boots is a little excessive for me. I can’t complain too much about having to bundle up right now – we leave in two days to go to the Dominican Republic. That means I’ll get to pull out all of my sweet summer favorites and wear them for a solid week in the middle of this frigid winter madness. I’m so stoked. What have you been wearing this month? This #GivingTuesday, please help Freekibble.com, Halo and GreaterGood.org to deliver 5 million nutritious meals to hungry shelter pets over the holidays. One of the biggest expenses for shelters and rescue groups is feeding pets in their care. As the temperature drops this holiday season, shelters that are already overcrowded incur extra expenses. When disasters strike, the need for food becomes even more dire. That’s why for Giving Tuesday, GreaterGood is hosting a food drive for animals! The money raised today will provide nutritious meals to shelters and rescues across the country. Right now, freezing temps and hurricane recovery has shelters and rescues in desperate need of food. Your gift will help bring high-quality pet food to shelters and rescue groups nationwide providing nourishment to rescue pets who need it most. The best part? Animals that are healthy, happy, and well-fed stand a much better chance of being adopted. When you give $ 2.00, you will provide 80 meals for animals in shelters. Help make this the biggest #GivingTuesday yet! Donate Today.